High school - a time for proms, football and homework. But at Knox High, it's also time for some of the students to try out their new super abilities! They're powerful, confused and misunderstood. They create destruction and chaos wherever they go. They're hunted by the authorities... and by dark powers. In School of Hard Knocks, your GURPS Supers heroes must track down the city's brand new metahumans, discover what they want... find out who want them... and decide how to deal with them! School of Hard Knocks is a four-colour adventure for supers of 500 points or greater. It is also a sourcebook for GURPS Supers, with characters, settings, story ideas and a continuing campaign plot that can be used after the adventure is done. * The Hell-Raisers - a team of manical villains led by a hell-spawned demon. * The Forty Thieves - a team of high school supers with problems that ordinary teens never dream of. * Maps for two super-battlegrounds: Knox High School and Ridgecrest Mall. * Game stats for school buses, book and gym lockers, water fountains, vending machines, and many other things to smash, crush and toss around in super combat. * Adventure Seeds - spring-boards to further adventure, providing the GM with ideas to keep players busy for months. 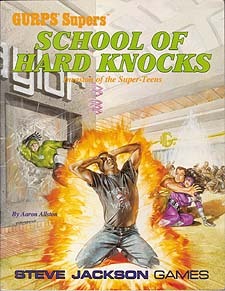 School of Hard Knocks requires the GURPS Basic Set, Third Edition and GURPS Supers. Ideas are included for the GM who wishes to translate the adventure to another genre, such as espionage or outer space. The adventure can fit into an ongoing campaign - or it can be used as an introductory scenario for a brand new set of supers! Plenty of GM advice is also included, to smooth the path if things go wrong. So buckle down, it's time to get an education... from the School of Hard Knocks.